This blog entry is based on a video clip from the film “Wasabi” starring Jean Reno. In the film, Jean Reno plays the part of a policeman. 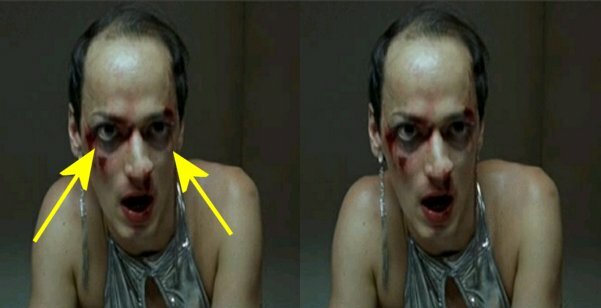 In events leading up the scene this blog entry discusses, Jean Reno has arrested a transvestite for questioning. His partners have questioned the transvestite with no luck. 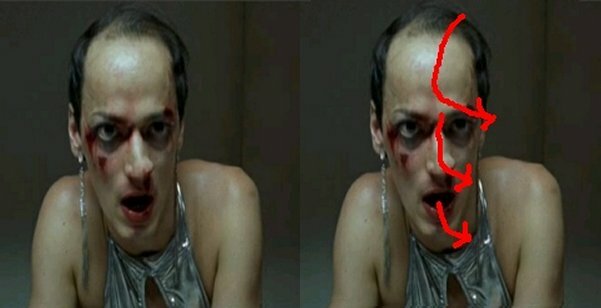 Jean Reno walks in and punches the transvestite in the mouth. 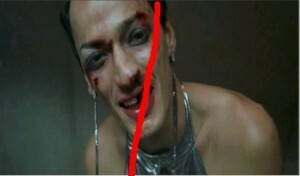 The transvestite’s head jerks to the side, then he spits out a tooth. That event, the transvestites reaction to it, and the further behavior of the transvestite in the movie scene are all influenced by the bodily changes that Homosexuality and Masturbation have caused in his body. During the conversation the transvestites head juts out in front of his body. A jutting forward head is one of the obvious bodily changes associated with Homosexuality and Masturbation. The transvestite habitually leans his right side leans further forward than his left side. That reaction is caused by shrinkage of the entire right side of his body. Whatever vertical level the right side of the transvestite’s head ends up is the height he feels his head really belongs at. The tooth that is knocked out of the man’s mouth is on the border between the side of his head that is sort of normal and the side of the head that has been damaged by the excessive masturbation. The red line is the dividing line. The man also displays another of the symptoms of masturbation mentioned on the list. His shoulders are not level. His right shoulder is inches lower than his left shoulder. while the left eye is so dark it is difficult to see clearly. This is another symptom on the list. A person who masturbates too much will go blind in one eye. The reason for most of these symptoms is that the man’s entire body is rotating to the left. A part of his left side is stable, it acts as an anchor like a pole in the ground. The rest of the body rotates forward around this pole. In this photo, I have drawn arrows to draw attention to a line on the forehead the curves to the left, how the nose itself curves left and how the mouth also slightly curves to the left. The right eye gives the impression it is large and swollen to the experienced eye. That large and swollen area is highlighted in this picture. Here is the complete video.